Hello you lovely guys out there! For today's post we still had to deal with the horrible weather in Zurich, but it looks like it'll get better for the weekend. We chose to shoot in front of the lovely "Florhof" restaurant and hotel which is quite near to our school and just such a pretty place to be! Soo you guys we'll see you very soon and we hope you all enjoy this post! I really like the look with the white dress and patterned blazer. Same thing with the weather here..
You girls are so pretty! Love the outfits! Lovely looks you two!! That skirt is amazing! 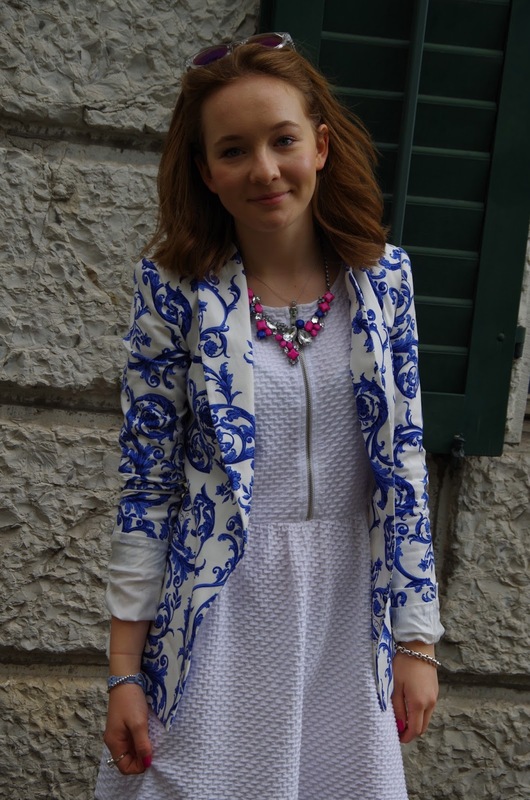 Saw the blue floral blazer in Zara last weekend and thought of you :) Have a great week! Great post! Love your blazer! Love your outfits! Where's the skirt from?? I love the ZARA blazer!!! You girls have such a lovely blog! You guys look so cute in your printed pieces :) Have fun traveling! I was missing your posts my friends! You both look stylish and beautiful as usual! molto bella sia la giacca che la gonna (; Reb, xoxo.